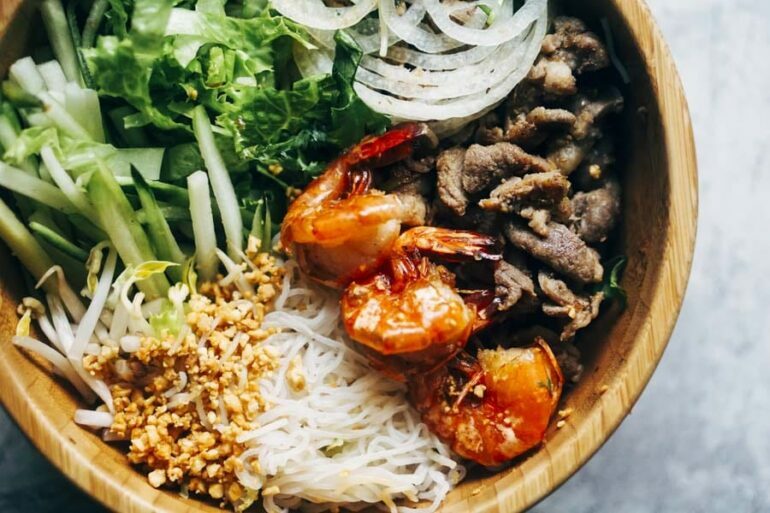 Low carb Vietnamese noodle bowls evolved into quite the cooking project. So much of what I make is based on staples that I have on hand in my pantry, freezer, or fridge. I assess my inventory and Make It Work à la Tim Gunn. As I continue to share recipes on the website, it becomes more and more apparent that I favor minimalist cooking. It makes it easier to plan meals around my macros, keeps my grocery bill down, and saves time in the kitchen. A pinch of this, a sprinkle of that, and dinner is on the table. This recipe is the farthest thing from that. Consider this your warning if you’ve come to love the quick and easy recipes from me. A lot is going on here. 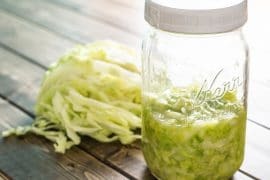 I’m talking not-so-everyday ingredients to track down, multiple cooking techniques, and quite a bit of experimental taste testing to nail the flavor profile. So why on earth would I do this, you might ask? 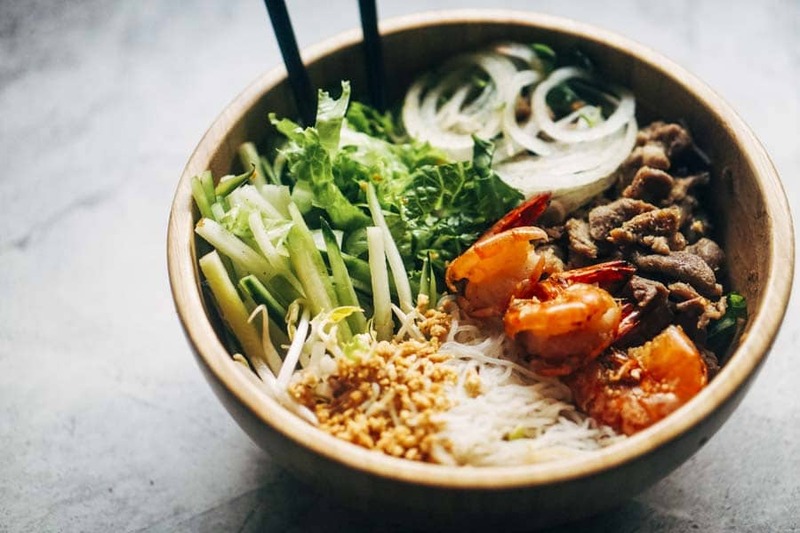 Vietnamese food is one of my all-time favorite cuisines, but the sugars and carb-loaded rice noodles have put an unjust barrier between me and some of my favorite foods. I grew up spoiled by my BFFs mom’s cooking and defaulted to local restaurants to satisfy these comfort food cravings as an adult. 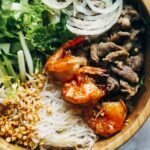 While Vietnamese noodle salads aren’t unhealthy, they are not low carb by any stretch of the imagination. 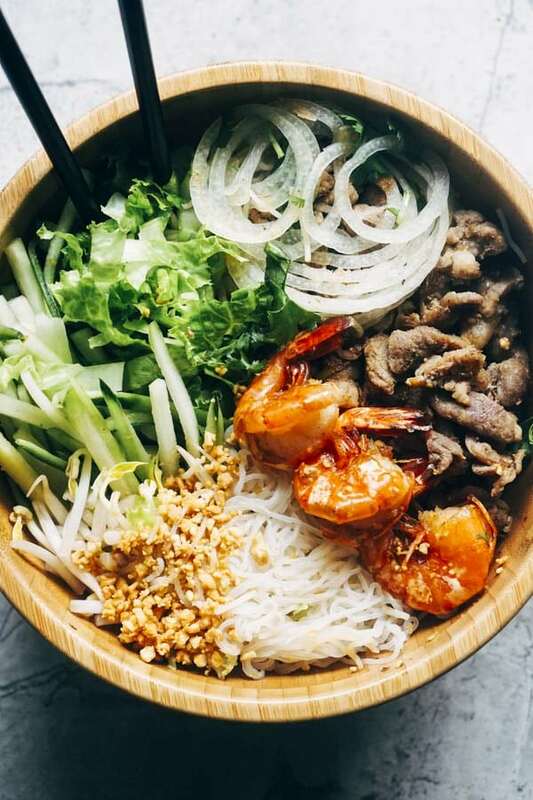 I’ve been on a mission to create a low carb Vietnamese salad bowl for quite some time. 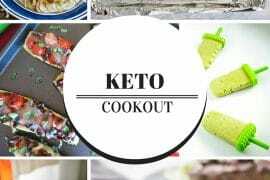 It boiled down to finding a keto work-around or giving into my cravings. Apparently, the latter was not an option. The dilemma with this specific dish is the rice noodles and sugar-filled sauce. I’ve used shirataki noodles to replace rice noodles in the past (like in my low carb pho recipe), so I knew that they’d work texture wise. But I’ve never used cold shirataki noodles. You see, part of what makes them palatable is that they soak up the flavor of whatever they are cooked in; not cooking them was not an option. I rinsed them (a lot) and boiled them in a water, salt, vinegar, and erythritol mixture to cut that weird shirataki taste. I drained them and let them cool before mixing them in with anything. I remember the OG sauce to be sweet and tangy, but occasionally spicy. I used my go-to erythritol sweetener, white vinegar, Red Boat fish sauce, and garlic Thai chili paste to make the sauce to dress the low carb Vietnamese noodle salad. Prep your veggies, cook your proteins, mix everything in one big bowl, and enjoy! Boil shirataki noodles for several minutes. Optional: vinegar and/or erythritol may be added to the boiling water to flavor the noodles. Drain the noodles and chill in fridge until ready to serve the salad. Salt the pork to your preference. Grill pork and shrimp over high heat. Set aside once cooked through. To construct the salad, divide each prepped salad ingredient into four parts to distribute into four separate bowls. The bowls should be large enough to allow tossing and mixing. 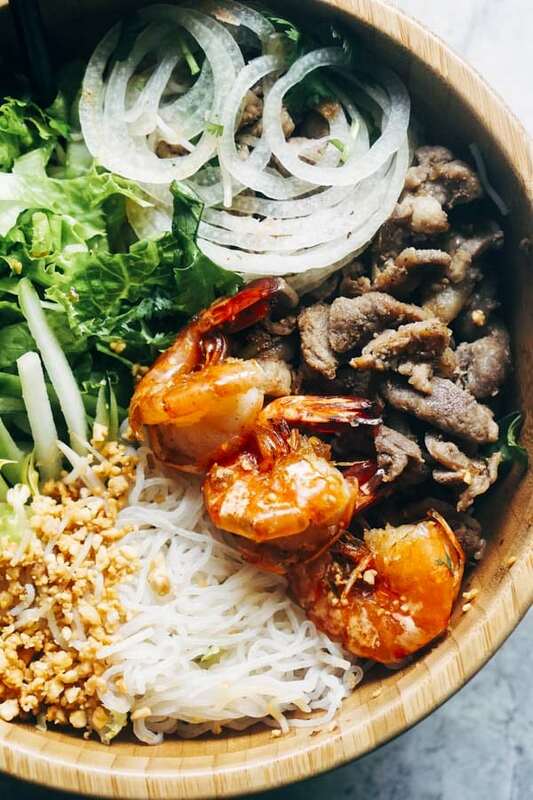 Layer romaine, cooked and chilled shirataki noodles, cooked pork and shrimp, mung beans, cucumber, cilantro, and peanuts. Whisk together water, white rice vinegar, fish sauce, erythritol, and Thai garlic chili sauce. 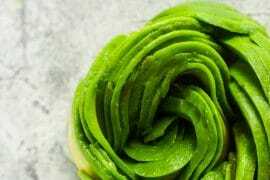 Serve drizzled over the noodle salad, then toss salad to evenly distribute. Red Boat is a gluten-free fish sauce brand. Never tried Nupasta, but I just looked it up and it looks promising! Thanks for the tip and alternative ingredient suggestion! Can you find shirataki noodles in your local grocery stores or these are mail order noodles only? My local Walmart has the shiratake noodles in the produce section with the tofu and meat sub hot dogs and such. I can tell, Tasha, that we are going to be besties! Thank you so much for this website, can’t wait to try out the next gen of keto. 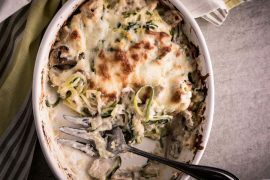 Was keto before keto was cool, but the lack of quality, tasty ingredients and time made me give up. Well, I’m back, better than ever! Umm You really going to “grill” all those 1/4″ rib strips as they will easily fall through the grill grates which is why it’s called a grill. Lol I guess you’re right, the way my instructions are written it would probably work out that way. 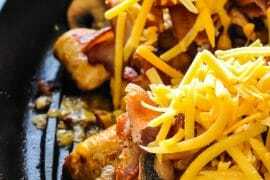 I live near Seattle where it rains year round, most of the things I grill are done inside on a cast iron grill pan on the stove top or an electric indoor grill. An update to the instructions to use skewers or indoor grill in that step wouldn’t hurt. This was so delicious! I will definitely make it again.